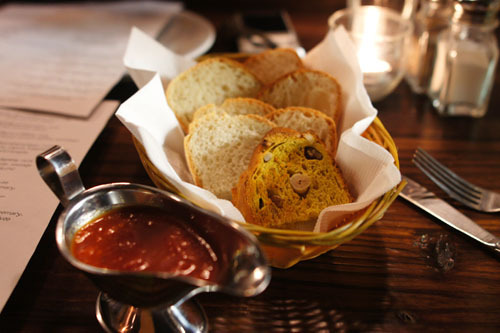 Of all of LA's Italian eateries, perhaps none has been so widely beloved as Osteria La Buca. Once only a tiny 20-seat restaurant, La Buca flourished under the leadership of its head chef "Mamma" Loredana Cecchinato and her son Filippo Cortivo. The strength of Mamma's handmade pastas and the charm of her seemingly simple dishes enabled La Buca to eventually triple in size, earning ample praise in the process. However, all was not well. Word on the street was that La Buca was becoming more and more "Americanized," much to the dismay of mamma and son. The pair left in late 2009, moving a couple blocks west (a stone's throw away from Providence) to open a new restaurant in the old Seafood Village space. 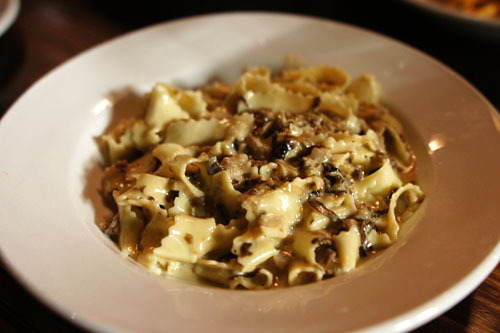 The aptly-named Osteria Mamma debuted in mid-March of this year. I was invited here by a long-time reader of this blog: Waleed of Foie Gras and French Fries. 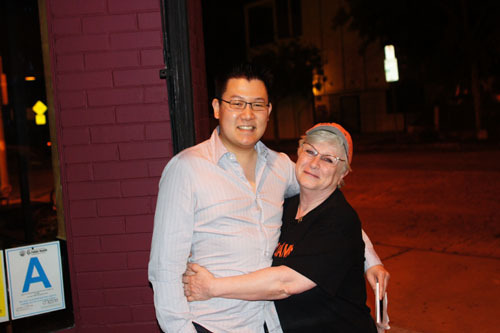 Waleed had been a fan of Mamma ever since her days at La Buca, and was eager to show me his favorite Italian joint in the City, especially given my slight historical disrelish toward the cuisine. The setup inside is a bit strange--there's far too much space behind the bar, and the bright glow from the kitchen is discomforting to say the least (and made for some less-than-stellar photos). 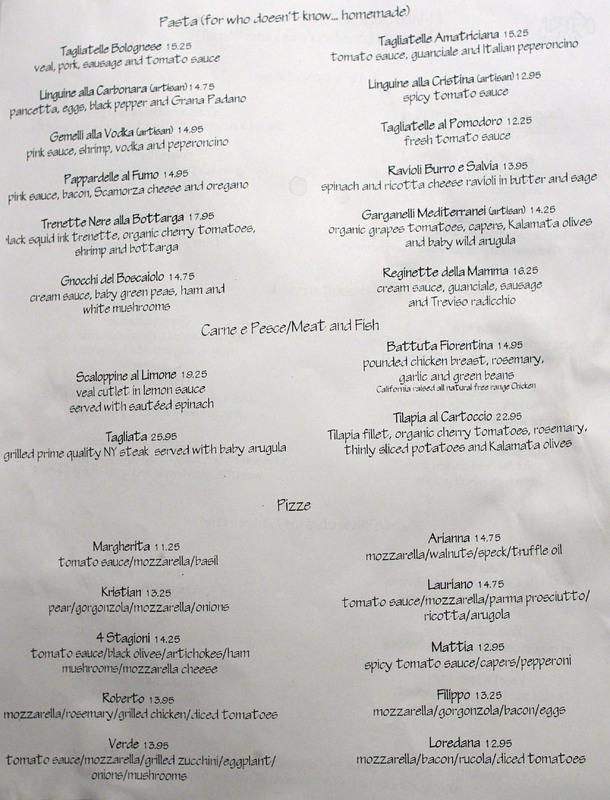 The menu, fortunately, hasn't changed much from Mamma's days at La Buca. You'll still find her antipasti and pizza, but the made-from-scratch pastas are the real stars here. Click for larger versions. Note that, as of this writing, Osteria Mamma still does not have a liquor license. The solution previously was to offer BYOB, but due to the actions of a snitch (La Buca? Mozza? ), who complained to the Department of Alcoholic Beverage Control, the restaurant had to put an end to the practice. Bread was disappointingly pedestrian, though it was perked up a bit by the tangy marinara sauce provided. The crostini were an easy choice to begin with. The cool, creamy, luscious body of Burrata formed a great interplay with the crusty bread, while the bitter greens and salty ham provided further layers of complexity, and of deliciousness. The truffle, meanwhile, added a trace of earthiness to the relative mildness of the cheese, but I would've appreciate a more forceful application. It seems like I've been on an octopus binge as of late, so I just had to order this dish, which, apparently, is a new item on the menu. The polipo was quite tender (a bit too much so, actually), and subtly sweet, but I would've preferred more of that savory char. Nevertheless, I loved the texture and starchy savor of the crunchy cubes of raw potato, as well as the juicy sweetness imparted by the tomato combined with the astringency of the arugula. I didn't even mind the celery, which was fortunately a bit less heavy-handed this time around than when Waleed first had this dish. 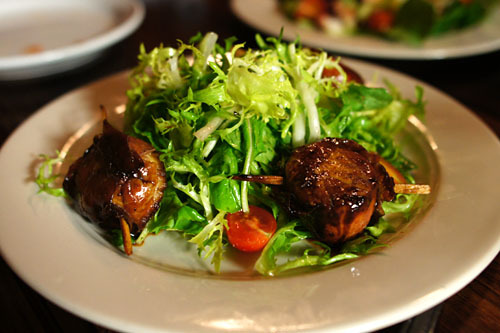 Bacon-wrapped scallops (or bacon-wrapped anything) always sound like a good decision, so this was an easy order to make off the list of specials that our server rattled off. Due to the bacon, the scallops had an intense sweet-savory-smoky flavor going on, which I found rather overwhelming actually. Thus, the use of the bitter greens in the dish was absolutely critical in tempering the bivalves' considerable potency. It was time now for the main attraction: pasta. We started off with the ribbon-shaped reginette, and it was a strong start indeed. I loved the robust, meaty attack of the dish, and how the sausage provided a great salty overtone to punctuate the paired cream sauce. Very good; however, a touch more bitterness from the radicchio would've been nice. 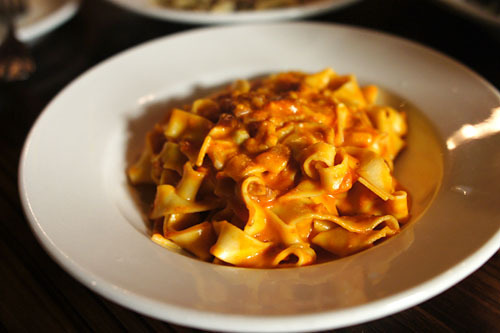 "Al Fumo" means "smoke," and sure enough, this pasta demonstrated just a hint of overarching smokiness, no doubt from the Scamorza. The pink sauce, meanwhile, showed off a tangy sweetness that transitioned beautifully to the lingering saltiness of the bacon. The oregano, meanwhile, added a subtle herbal flair to things. A few weeks back, while dining at Nakkara, I was instructed by Diana of Diana Takes a Bite that I just had to order this dish (she apparently had come here recently on a date!). In addition to coloring the trenette a pleasing shade of onyx, the squid ink also contributed a slightly salty taste to the pasta, while the tomatoes added a distinct sweetness. The star of the show here, though, was the delightfully snappy shrimp, which really did a great job in conveying the briny essence of the ocean, aided, of course, by the application of bottarga (cured roe). This was probably the best Carbonara dish I've ever had. Flavors were classic, but superbly focused, robust even. I enjoyed the lovely "al dente" texture of the linguine paired with the luxurious creaminess of egg, and how the pasta was perfectly tinged with the saltiness of pork belly. The liberal use of black pepper provided an interesting focal point, while the sparing use of Grana Padano (it's the new Parmigiano Reggiano) added just a bit of weight to complete the dish. Apparently, at the old Osteria La Buca, one was able to order Mamma's gnocchi with any available sauce. Here though, it looks like we're stuck with the Boscaiolo ("lumberman") sauce. I'm not complaining though. 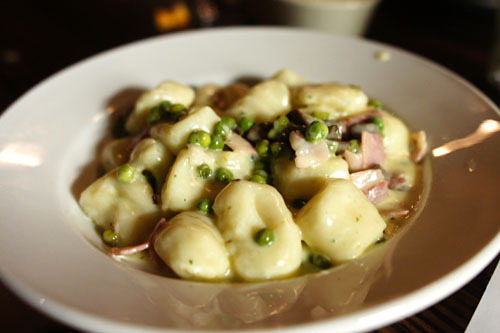 These soft, dense pillows of potato were beautifully countered by the vegetal tang of the green peas and the wonderfully salty ham, making this one of the strongest gnocchi experiences I've had to date. For dessert, a wide array of tarts is available, along with Mamma's famous tiramisu. Click for a larger version. 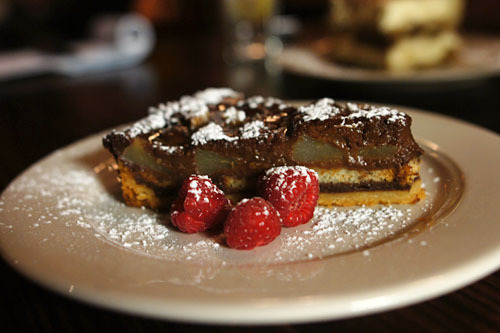 Easily the most intriguing of the tortas was this chocolate and pear version. The tartness of the fruit was actually a fitting counter to the richness of the chocolate, and I also appreciated the tort's warm, crusty base as well. I'm usually quite "meh" about tiramisus, but this was clearly a stand-out. I loved its cool, creamy, ethereal consistency, and how the initial sharpness of coffee transitioned into luscious, sweet, nutty goodness. 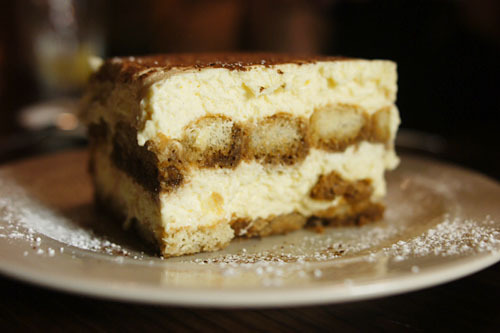 Easily one of the best (perhaps the best) tiramisus I've had. Mamma hanging on for dear life! 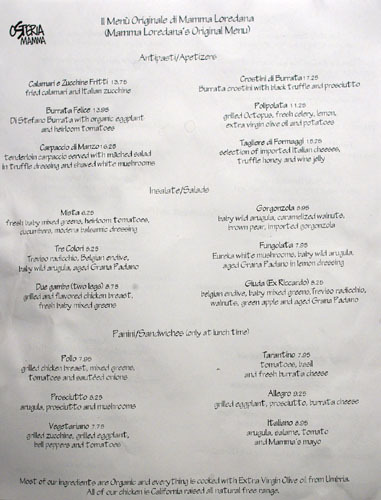 I must preface things by stating that I had never visited Osteria La Buca under Mamma's tenure--I came in without expectation, without pretense. From the looks of things though, it seems like Mamma is back, with a vengeance. 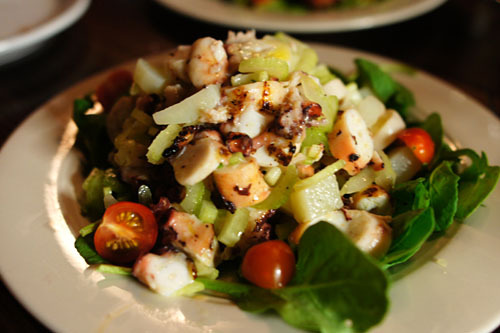 The food isn't something that'll "wow" you, but the enchanting appeal of Mamma's rustic, handmade dishes is apparent in spades at this lovingly-rendered Italian gem. 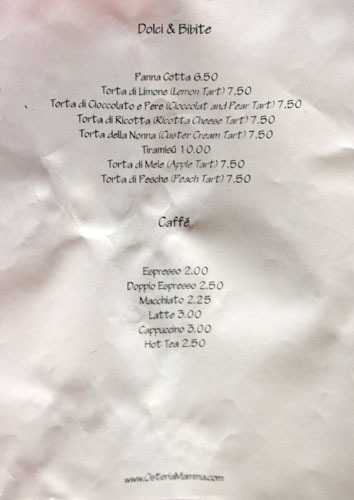 The Italian fare looks quite solid. Another one to add on my list along with Angelini Osteria. 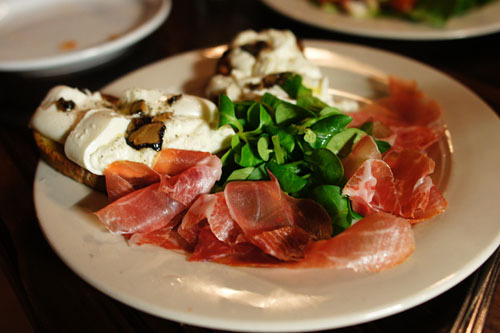 Any interest in hitting up Angelini Osteria? Aw, Mama loves you! Handmade pastas are one of my favorite things! oh man.. bottarga pasta. It's 8am and I was just about to plan a Mo-chica dinner. But now you've made me conflicted. Kevin.. Kevin.. Absolutely loved the squid ink pasta when I had it here a week ago. Something I'd definitely go back for in itself. But I might wait until they get their liquor license. I really missed a glass of red with my meal. i love handmade pastas and damn that's a lot of eating kevin. so many places to visit still...this being one of them. wow im so curious of how everything tastes and feels... i would love to dine w/ u kevin. just nothing too expensive;;; kitchen guys are poor but i'm willing to learn!!! 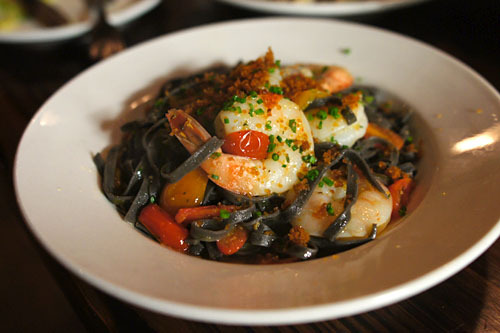 i liked the squid ink pasta at Valentino better. 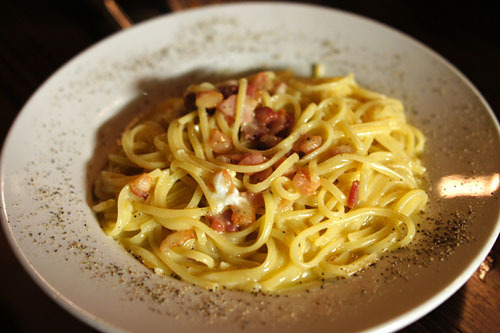 Carbonara looks amazing, thought it would be creamier and heavier so i didn't order it, but this looks great! next time for sure! Thanks for accepting a stranger's invitation to dinner. My girlfriend and I both a great time and stuffed beyond belief. Our tastes were similar on this trip. The standouts for us were the reginette, shrimp, linguine, gnoochi, and the tiramisu. We would be more than glad to join you anytime you are town, but you'll have let us pick up the tab next time. Thanks for the plug to the work in progress I have. Maybe our dinner will motivate me to get my blog up and running. Kung Food Panda, I'd love to give Angelini another shot as I'm 0 for 2 at this place and have yet to have a decent dish. I don't get the hype. Kevin continue the good work. Our little neighborhood gem was well represented. Danny: Maybe, as I was at Angelini not too long ago with Selina. When are you going? Cathy: Lol. Do you know of any other places that are good for handmade pasta? Cube? Cynthia: So did you end up going to Mo-Chica? If so, what'd you think? Collier: I think I'm slowly turning around. So is Madeo your top pick in the City? Where else is good? James: How are things going at Providence? What station are you working now? What are some of your favorite places? SC: What type of pasta at Valentino? I had the squid ink risotto there and it was quite good. Yeah, definitely let me know which other Italian places you like, and I'm very interested to hear about your new place coming up. Got a name yet? So is the squid ink a must order indeed? Did you end up getting it? I don't think they still offer the trenette, but I'd get any other squid ink pasta that they have.